The question was fairly simple, not to mention obvious. Why are you, Kacey Wilson, spending time on the Pearson campus this summer? But the answer was delightful — and spoke volumes about the cross-pollination of ideas and the commitment to student health and wellness that benefits all 17 UWC schools around the world. “There were two serendipitous encounters,” said Wilson, a wellness counsellor and health support teacher at UWC Mahindra in India. “One was Libby Mason visiting Mahindra — she really offered a lot of support in a short time to many of us and she brought a language of appreciative inquiry and coaching models that helped refine some of our team processes in a beautiful way,” said Wilson. Mason, a Pearson College UWC faculty member and former Dean of Students, spent part of a recent academic leave visiting and working with four other UWCs around the world. PSYL is a three-week, interactive and experiential learning program that offers a UWC experience for students in grades 10-12 (ages 15-18). More and more UWC schools are offering or weighing the possibility of offering “off-season” programs. Also prompted by a Mahindra staff member interested in PSYL, Wilson began her own research. 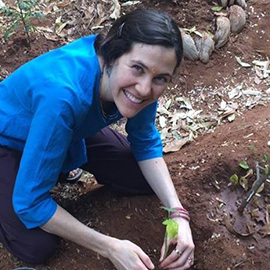 Wilson heard about UWC after moving to India from her U.S. home, and a career that took her to a teaching role in Brazil, to further deepen her studies of Ayurveda, a holistic approach to health and lifestyle originally developed on the subcontinent. An enquiry to the nearby Mahindra school was positive and Wilson found herself volunteering at the school for three months. The school’s response reflected a strong and growing commitment to overall mental, as well as physical health and wellness on the part of leadership throughout the UWC movement. Wilson emphasized that the school already had resources and support for students, but the size of the school (240 students) meant that additional resources were always welcome. “I am really lucky to work with a team. We have a full medical staff on campus (and nearby consulting specialists) — we work together in conjunction with the Head of Student Life, advisors and others who may need to be drawn in to support student wellness. “We act as a triage team – to identify if students present with a medical, psychiatric, a learning challenge or a daily lifestyle concern, such as are they getting enough sleep, are they eating properly, are they managing their time properly? The wealth of academic, experiential, community service and other opportunities available to students at UWC schools can be intimidating and sometimes overwhelming. Combine that with youthful FOMO (Fear of Missing Out) “on all the amazing opportunities at this and every UWC,” means life balance needs to be addressed from time to time. Observing and working with a program such as PSYL at a different UWC school gave Wilson the opportunity to also consider the holistic experience for young people from around the world who, at a very early point in their lives, make a commitment a global education. “My intentions in visiting the PSYL program were to learn more about how social and emotional learning capacities are taught to this age group in an experiential manner and UWC setting. “One of the things I’m taking back is a deeper appreciation for the power of transformational learning and experiential education,” she added. “So much of the work offered by UWC schools happens in an embodied, lived experience which is not just the transfer of knowledge but the transference of shared experiences and the building of a new repertoire of how to see self, how to see others in a historical context in a way that beautifully acknowledges the complexity of the world that we’ve inherited, the work that needs to be done as a result of what we’ve inherited and the hopes of where we might be able to go if we can do certain work together.